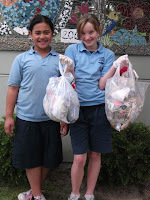 The Addington Article: TV Show Inspires Student Led Clean-up!! TV Show Inspires Student Led Clean-up!! Yazmin Miles-Watson was watching the Erin Simpson Show yesterday after school, and was inspired by the show's star, to go out and clean up her own street. 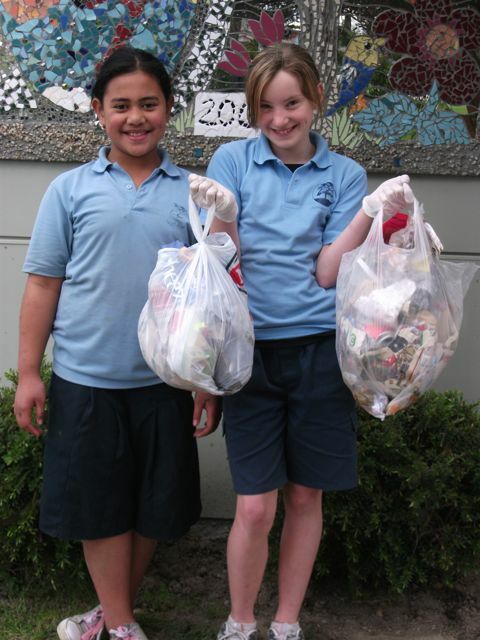 The clean up is part of National Clean Up NZ week which runs from 17 Sept to 24 Sept. In just an hour Yaz, (aged 11 yrs,) filled three supermarket bags from around her street. Today at school, she gave up her morning tea and lunch times to do a thorough clean up of the bushes and trees along the school boundary! She inspired some friends to join her, and they cleaned up other areas of the school. Most of the boundary rubbish was from people who pass through the school grounds outside of school hours. There were wrappers, cigarette butts and beer bottles which were "disgusting" explained Yaz. Yaz (pictured with Line Kalolo) hopes to encourage more of her classmates to help clean up other areas of the school community. Fantastic Addington Attitude Yaz!! We are very proud of the initiative you have taken, and the inspiration you are to our school.